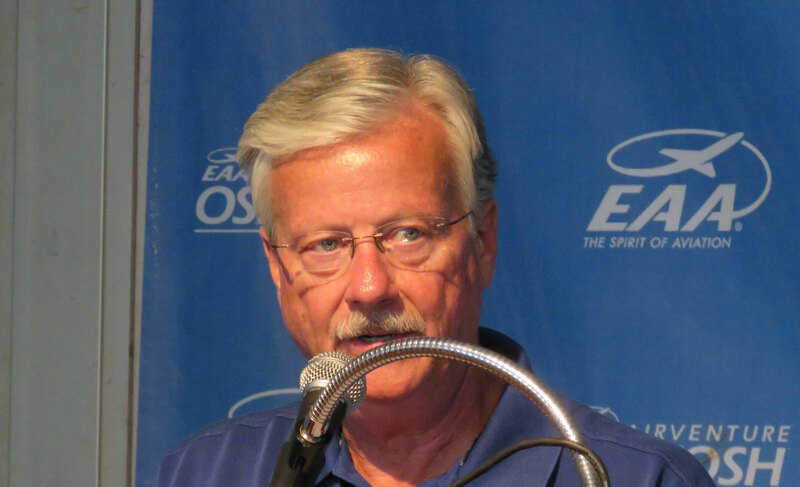 In remarks that were stunning in frankness and candor, EAA chairman Jack Pelton blasted House Transportation Committee chairman Bill Shuster (R-Pennsylvania) and the Trump Administration for their tactics in attempting to hijack the General Aviation Caucus and "ramrodding" air traffic control privatization legislation to congressional approval. "There's been more dirty politics on this than I've ever seen," said Pelton on Monday at AirVenture. This includes scheduling meetings for general aviation input when Congress was not in session and pro-privatization congressional leaders threatening colleagues who oppose the legislation with retaliation, including withholding natural disaster insurance relief. Pelton said there are numerous reasons to oppose privatization as currently constructed in the legislation, including: removal of local control of contract tower operations; the inability of a privatized entity to provide special-event ATC; and liability to high-traffic events such as AirVenture, The Masters golf tournament, Nascar races, and the Super Bowl; non-competitive nature of how the ATC contract will be awarded as the legislation is currently drafted; and questions about the costs of capital rate of return and the amount of capital required to fund modernization. "The new privatized ATC system will have no sovereignty. There's nothing in the bill that says privatized ATC needs to support [special events]," Pelton said, adding that Shuster purposely excluded such events from the bill unless GA organizations agreed to support privatization. "There are things that have happened in the last two weeks with regard to the whipping [to gain support for the bill] that downright look illegal," Pelton said. He said groups that joined the United GA Front that opposed the bill had been threatened with legislative payback unless they endorsed the bill and urged all their members to support it. "It's Tony Soprano at work. It's just fantastic," Pelton said. "Right now there are meetings going on virtually every day with Shuster and [Rep. Sam] Graves [R-Missouri] with congressmen who are undecided or who said they would vote 'no'" who are being subjected to strong-arm tactics, Pelton said. He cited a Northern Wisconsin congressman whose district suffered flooding and needed insurance relief. According to Pelton, that congressman was told, "You vote no on privatization and that insurance bill will never see the light of day." Pelton said the argument that privatization is required for modernization was a canard and the issue could be solved if Congress would provide the FAA with stable, multi-year funding for its technology upgrade programs. "[Private] lenders don't provide capital for free," Pelton said. "You're starting out without enough revenue to cover the cost of what has been put into it. This thing is a slippery slope that gets to the point [real fast] where they say, 'We need to up our revenue because we are not covering costs that we have to absorb.' Congressman Shuster was really pointed in saying that we aren't going to give you GA [general aviation] guys any more seats [on the private ATC board] because you don't provide any revenue to the system. You guys are going to have no voice." Calling the pending legislation "privatization" is really a misnomer, Pelton said. "It's a ramrod job that they think will be a tipping point for other privatization activities to occur. The President's [corporate chief] pilot likes to say he likes to blow things up and reconstruct them, because they are better in the end. That's probably okay with an apartment building or a casino or somewhere where there is not public safety at stake. You blow this up and it doesn't get reconstructed properly and we will have huge issues from national security to the flying public." Pelton said that the average airline CEO is in office less than five years and likely won't be around when the legislation is implemented, but general aviation users will. "We will be the ones who suffer."